The “…And Scene” Blogathon hosted by Sister Celluloid celebrates all those moments when we scream “I love this part” at the screen. The times when we feel impatient for 80 minutes until our favourite scene bursts onto the screen. The times when we rewind over and over again to enjoy it ‘just once more’ before we continue out of obligation because nothing quite lives upto that one moment. 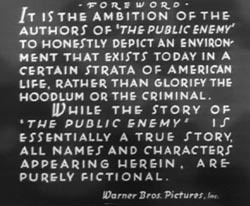 William A. Wellman’s The Public Enemy (1931), not to be confused with Michael Mann’s Public Enemies (2009), features one of my favourite scenes from classic cinema. Alongside other classic 1930s gangster flicks such as Little Caesar (1931) and Scarface (1932), The Public Enemy was actually the focus of my undergraduate dissertation which posed the question: ‘To What Extent Can Gangsters of 1930s Cinema be Regarded as Heroes?’ A question that I still find fascinating today and at it’s simplest interpretation translates to a wholly current discourse. To what extent does cinema reflect a sign of the times? I won’t bore you with the semantics because you’re most likely reading this to see James Cagney smash a grapefruit into Mae Clarke’s face, but it is a question worth considering next time your movie stub is torn. Wellman’s Public Enemy came at a time when the Eighteenth Amendment (Prohibition of Alcohol) was still in effect. The rise of gangsterism during the period 1920-1933 has been well covered by film makers and understandably so but during the 1930s gangsters on screen became public icons rather than enemies despite the insistence of studio disclaimers. The Public Enemy tells the tale of Tom Powers as he is nurtured into a criminal lifestyle from a young age and on into adult life. Becoming involved in a bootlegging racket and all of it’s ‘glamorous’ duties Powers grows into a troubled lifestyle that has its sights set on retribution. In a scene that has become famous in the world of classic cinema, particularly concerning the portrayal of gangsters, both Cagney and Clarke, who plays Kitty, mutually agreed that it would be fun to play a practical joke on the crew, just to see their reactions. With no intention to get the scene into the final cut it’s even more shocking. As a viewer 84 years after this scene was first witnessed on the big screen I can tell you that without any prior knowledge of what was about to happen my reaction was probably similar to that of the cast. Powers: Ain’t you got a drink in the house. Kitty: Not before breakfast dear. – Clarke duly responds. The scene builds quickly, establishing Cagney as the dominant character with temperament issues and Clarke playing the innocent victim of bullish gangsterism. As Powers continues to lay into Kitty she supposes he might have somebody else. All at once we’re caught off guard. He rises, reaches for a half grapefruit and smooshes it into Clarke’s face causing raised eyebrows, a drop of the jaw, and a slight nervous chuckle at the absurdity of it all. Ron Burgandy’s memic line, “That escalated quickly” has never rung so true. I’m not surprised to hear it was something the actors improvised. It feels raw, emotional and perfectly in tune with the characters. In the back of my mind, I always thought maybe one of Wellman’s wives actually did that to him! I’d imagine even trying to rehearse that would have been a bit annoying (and would have burst the fruit budget on the film, heh). Watching that again makes me chuckle because of the way the film ends. I bet Tom wished he had a half grapefruit to fall face down onto! Apparently it wasn’t scripted, a mutual agreement between Cagney and Clarke to gauge the reaction of the horrified crew haha, I can imagine if it were rehearsed the fruit budget would have been through the roof for sure! Haha sort of like ‘I told you so’ moment, that would have been good.